Iridium and Globalstar arguably disrupted the telecommunication industry with the launch of their respective LEO satellite constellations. As the legacy players of this arena, they experienced first-hand the challenges that come with, and historically, predominantly outweigh the benefits expected from the implementation of large satellite communications constellations. In the last decade, lessons learned from these early players, combined with technological advancement and realisation of the full potential of LEO constellations, has given rise to various new business models. From ‘mega-constellations’ such as OneWeb to the smaller (in every sense of the word) IoT constellations such as ELSE’s Astrocast, the communications industry is at the brink of a second wave of disruption with the offer of low cost, low latency Internet services across the globe. Survival amid this disruption will be challenging – for both existing and new players. The main industry segments most affected by Non-GEO constellations are HTS Communications, IoT and Earth Observation (EO). Each of these segments presents its own set of challenges and therefore different barriers to success. NSR’s Satellite Constellations: A Critical Assessment report investigates for the first time what guarantees success for LEO constellations within these three segments and the associated disruption on the industry. OneWeb opened the door to so-called ‘new space’ LEO-HTS satellite constellations with their FCC filing approval in 2017, and others including Telesat, LeoSat and SpaceX (Starlink) followed closely. The bottom-up approach – knowing that demand is not unlimited – suggests that higher revenue requires a higher market share, which further requires low latency and higher coverage. That is the main value proposition of mega-constellations. However, the bigger the constellation, the higher the capital investment needed, and the higher the complexity of manufacturing with (because of their architecture) higher replenishment cost. All these issues contradict the top-down approach of keeping costs low to sustain low and (highly) competitive pricing. For LEO-HTS constellations, the biggest barrier to success is solving this paradox. HTS constellations, in general, are expected to offer a slow ROI due to the significant amount of CAPEX needed to get these constellations off the ground. Based on the business cases currently proposed and announced, 2 out of 5 constellations NSR analysed are not expected to be sustainable if launched. 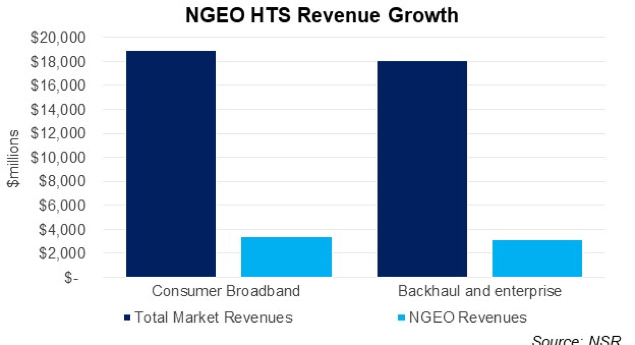 The new Non-GEO constellations are expected to cause the biggest disruption in the HTS segment, conspicuously in Consumer Broadband and Backhaul/Enterprise verticals. New IoT constellations such as Hiber, Astrocast and Kepler have a unique business case based on providing low cost, low power IoT solutions. This market is currently addressed by companies like Sigfox and LoRA on the terrestrial side and – to a limited extent – Iridium, Globalstar and Orbcomm on the satellite side. These new business models have a potential to offer myriad opportunities – including some that do not yet exist. Although the growing awareness of these applications is firming-up, reliability, latency and pricing will really define the ‘make-or-break’ criteria for these business cases. Relatively low investment and revenues but relatively faster positive ROIs convey the conclusion that NSR believes these constellations will generally be sustainable. 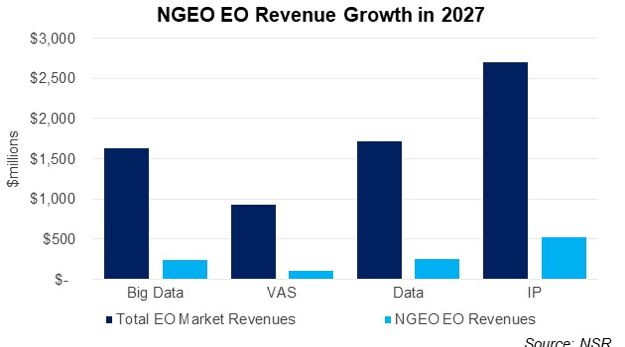 However, these new LPWAN IoT constellations, despite offering the highest innovative disruption value, are not likely to have a significant impact on the overall satellite industry – financially, contributing just over 2% of overall NGEO revenues by 2027. Earth Observation, by nature is a LEO dominant segment, but that does not necessarily ensure success for all new proposed constellations. Excessive oversupply, resulting in overall pricing drops for medium and low-resolution imagery adversely affects the revenues from this vertical. Redirecting market share from established players is another significant challenge for new EO constellations. A combination of low revenues and insufficient market capture will restrain at least one EO constellation from closing its business case. Various new business models have been – and are being – proposed for Non-GEO constellations. The growing awareness of the disruptive potential of LEO constellations, combined with progression in technology are enabling factors in the success of these business cases. However, the feasibility, and more importantly, the sustainability of success will be driven by the Darwinian theory of survival within each market segment. While some have a clear business case, others – as is the case for most LEO constellations – are more reliant on funding to become justifiable. And then there are certain cases that are not likely to gain enough market share to compensate for the required investment at all. Though each market segment has its own challenges that differ at the more granular level, a balanced combination of sufficient funding, strong market access strategy and sustainable low pricing will be the key to success for all.